Bowser and his troublemaking kids have plunged the land into chaos by transforming all the local kings into animals, and it's up to Mario and Luigi to stop them. 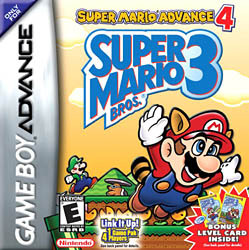 In what many consider to be the best Mario game ever, you'll have to run, jump, and stomp on enemies through eight enormous worlds as you use awesome new power-ups like the Warp Whistle and the Frog and Tanooki Suits. The epic platformer spans the land, sea, and sky, and it's only the beginning of the fun to be found on this Game Pak. Players can add cool new features with the Card e-Reader or link up with friends for multiplayer mayhem with the original Mario Bros. game. Any way you play, it's one of Mario's greatest adventures-and it's all in the palm of your hand!